MMM group photo, October 2018. Developing innovative materials that meet the complex requirements of a diverse range of applications is only possible if the relation between their inner structure, i.e. the microstructure, and their properties is thoroughly understood. 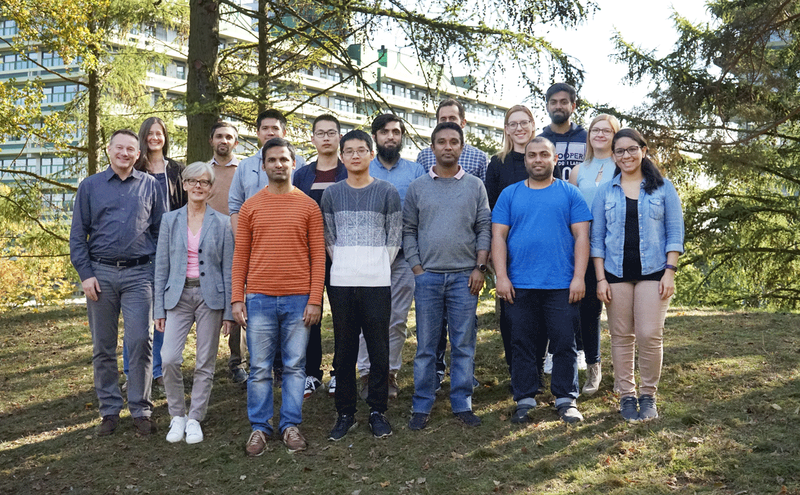 We derive such microstructure-property-relationships to predict macroscopic mechanical properties of materials, like strength, hardness, and fracture toughness, by employing the methods of computational materials science and multiscale modelling. To accomplish this, we typically start from macroscopic models that describe an engineering application or laboratory experiment and introduce information about mechanisms or material parameters that have been derived from more fundamental scales, see Figure 1 for an example about scalebridging in fracture modelling. Fig. 1: A novel approach to bridge the scales from atoms to continuum in fracture modelling has been developed. With a physically consistent scaling law, data from density-functional calculations of atomic bond characteristics (right subfigure) can be directly applied in continuum fracture models (left subfigure). The approach has been validated with molecular dynamics simulations (middle subfigure), see Möller et al., JMR 33 (2018) 3750. Macromodels typically do not consider the microstructure of a material explicitly, but are based on the idea of homogeneous material behaviour, which is a severe restriction of such models. However, they can be very useful to identify critical regions with high mechanical stresses and strains within a component or loading conditions that are potentially damaging. At such critical spots, a micromechanical model is employed that explicitly takes into account the local microstructure and mechanical conditions, taken from the macro simulation and applied as boundary conditions to the microstructure model. The microstructure in such micromechanical models is described by representative volume elements (RVE) that can be developed on different purpose-specific levels of detail, to represent either phases as homogeneous regions or individual grains within phases or even sub-structures within grains. Such micromechanical models serve mainly two purposes: Firstly, they yield insight into the critical deformation and failure mechanisms and how they depend on the microstructure and local thermal, mechanical, and chemical conditions of the ma1terial. Secondly, they provide the basis for macroscopic descriptions of material properties in form of flow rules as they are used in continuum plasticity. This latter step of developing macroscopic flow rules based on micromechanical models is termed homogenisation and can be used to take microstructural properties and mechanisms implicitly into account in macroscopic models of engineering problems. Figure 2 shows an example of a micromechanical model of a polycrystal that couples crystal plasticity and diffusion of hydrogen through the microstructure. 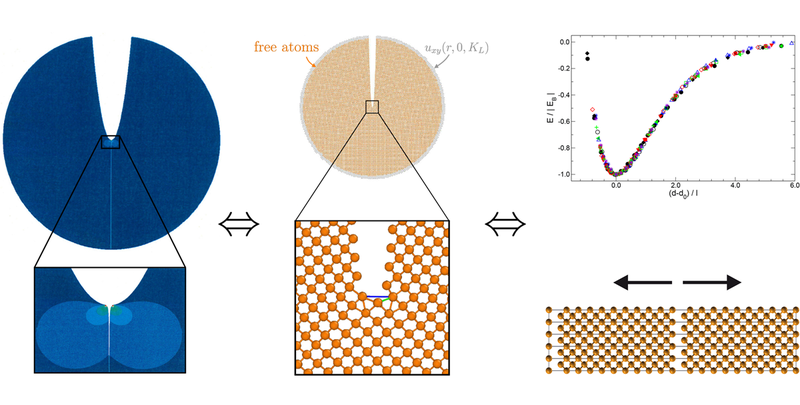 Elastic strains change the driving force for hydrogen diffusion and segregation, which is quantified by ab-initio density functional theory calculations. Furthermore, plastic strains alter the density of hydrogen trapping sites. Thus, such a coupling of mechanics and diffusion is important to understand the nature of hydrogen distribution within a microstructure, which is an essential mechanism of hydrogen embrittlement. Fig. 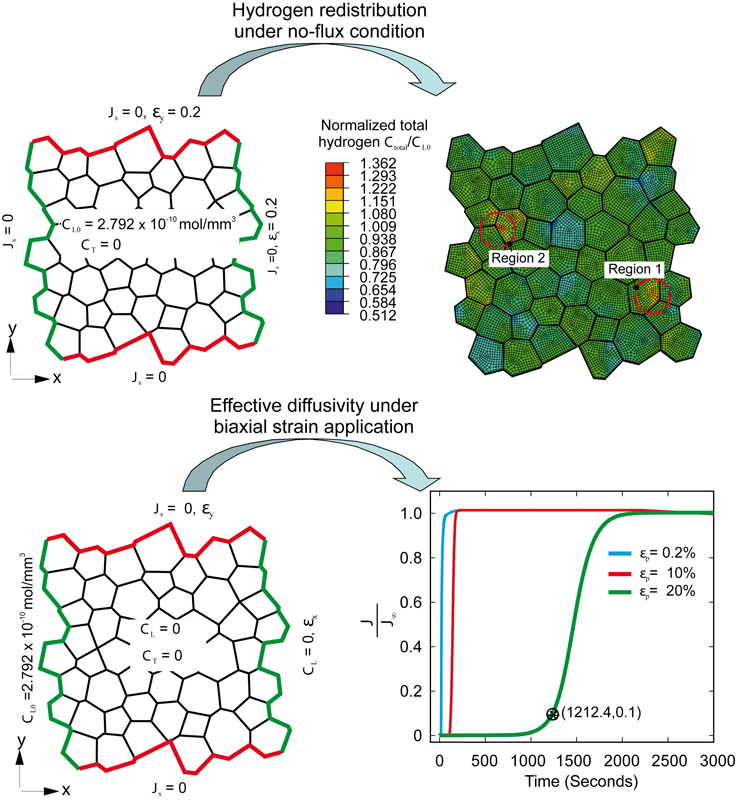 2: Hydrogen diffusion through a microstructure is significantly affected by local elastic and plastic strains. Hence, a direct coupling of mechanics and diffusion kinetics is important to reveal the mechanisms of hydrogen redistribution in microstructures and how it contributes to hydrogen embrittlement. The top subfigure shows the results of the hydrogen redistribution within a predeformed microstructure, whereas the bottom subfigure demonstrates that this kind of modelling can be used to predict transient states of hydrogen diffusion kinetics that can be compared to experimental data, see ul Hassan et al. Phil. Mag. 99 (2019) 92. One increasingly important aspect of research in the department Micromechanical and Macroscopic Modelling is to establish links between numerical modelling and experiment. As seen in Figure 6.2, our models yield results that can be directly compared to experiment, which enables (i) their direct experimental validation, and (ii) the parameterisation of micromechanical models by inverse fitting to experimental data. In view of the relatively large number of model parameters, the latter approach is currently a major thrust direction of our research. Fig. 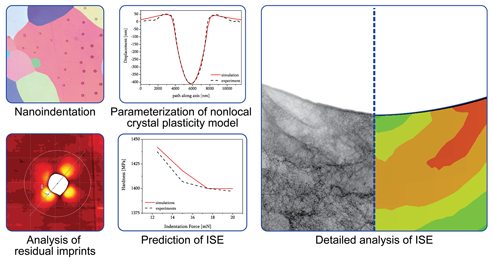 3: Parameterisation of a non-local crystal plasticity model by inverse modelling of nanoindentation experiments supports our understanding of indentation size effects (ISE). Spherical nanoindentations have been performed in a coarse grained ARMCO iron polycrystal (top left) and the pile-up structures of individual imprints have been analysed (top middle). The parameters of a non-local crystal plasticity model have been adapted in an inverse procedure to yield the optimum comparability of the imprint topology be-tween numerical simulation and experiment (bottom left). The thus-parameterised crystal plasticity model can predict the ISE found in experiment in a quantitatively correct way (bottom middle). A comparison of predicted and measured dislocation structures beneath the indentation supports our understanding of the mechanisms of this ISE, see Engels et al. Materialia 3 (2018) 21. Mon - Thu: 1:00 p.m. - 3:00 p.m.